As the need for chronic disease management grows, so does the need for highly trained general practitioners. Trained in Internal Medicine with experience in treating patients both in the hospital and the office, husband and wife team Dr. Michael T. Bianco and Dr. Shelley H. Bianco are accepting patients for their primary care facility located in Alpharetta, GA. At Bianco Primary care you will enjoy the benefits of pro-active/individualized care instead of the reactive/cookbook style that has become the standard. Shelley and Michael are osteopathic physicians who feel comfortable treating complex medical conditions by virtue of their experience with acute medical patients. They are dedicated to educating their patients about their physical and emotional health, addressing the whole person and their overall wellbeing. Certified in plant-based nutrition by Cornell University, Dr. Shelley and Dr. Michael also look at lifestyle and nutrition to inform individual treatments. Lifestyle and nutrition are key factors in becoming healthy and maintaining health. 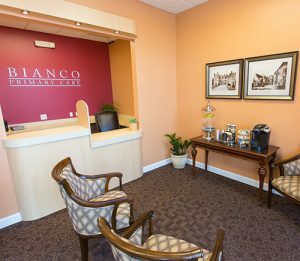 Restoring strong patient-doctor relationships is at the heart of Bianco Primary Care. Michael and Shelley recognize that impersonal care and rushed appointments don’t do enough to prevent and reverse chronic illnesses. That is why they established a practice that is designed for the ultimate personalized healthcare experience. Patients can expect a friendly staff to greet and assist them, as well as little to no wait time to see the doctor, and a calming, comfortable environment.